Boeing has spent decades spreading big money around Washington, D.C. Now the aerospace giant will need to lean on its network of lawmakers and lobbyists as it grapples with one of the worst crises in its history. The company has almost tripled its spending on U.S. politicians and political committees in the past decade. It’s also shelled out $15 million to $21 million annually in the same period on lobbying in Washington — topping spending by rivals Lockheed Martin, United Technologies and other corporate giants such as Amazon.com and Comcast. Such expenditures have helped make the aviation company one of the most powerful influence brokers in the nation’s capital. 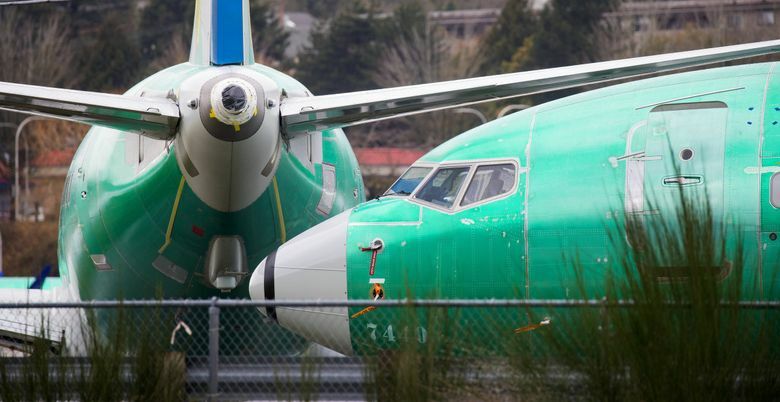 Its carefully cultivated relationships — including one with President Donald Trump — are being tested as lawmakers, regulators and federal prosecutors scrutinize the company’s coziness with the Federal Aviation Administration following two catastrophic crashes of its 737 MAX 8 aircraft. Senators and representatives from both parties called for the planes to be grounded, and Trump himself announced the decision to ban the MAX planes from flying March 13 after the FAA wavered. The Transportation Department has ordered a full audit of the FAA’s 2017 certification of the MAX and the Justice Department is also investigating. A Senate panel is hearing from government officials that oversee commercial aviation next week and also intends to call Boeing executives, pilots and other aviation industry groups in the near future. Tim Keating, a former legislative director for the Clinton White House who heads Boeing’s lobbying team in D.C., is well-known for working on both sides of the political spectrum. He’ll especially need to leverage those relationships now. Much of the lobbying outlay by Chicago-based Boeing — the second-largest U.S. government contractor — is related to military spending, not commercial aviation. Boeing ranked 11th among the nation’s top influence spenders by the Center for Responsive Politics for the $15.1 million it spent in 2018. The U.S. Chamber of Commerce was first at $94.8 million. Boeing has some high-profile figures on its team, including former Representative Norm Dicks, a Washington state Democrat who served as chairman and ranking member of the House Defense Appropriations Subcommittee in his final years in office. Dicks lobbied on two of the company’s projects for the Pentagon, the F/A-18 Super Hornet and the KC-46A tanker plane, disclosures show. He didn’t respond to a request for comment. Boeing added Ballard Partners, founded by one of Trump’s biggest fundraisers in the 2016 election, to its roster of lobbying firms in January. That month Brian Ballard and two of his colleagues registered to lobby on international trade and aviation issues, according to a disclosure filed with the Senate Office of Public Records. Ballard declined to comment on the firm’s work for Boeing. Last year the company employed 98 lobbyists, including 31 in-house, who contacted Congress and 24 federal agencies and offices on its behalf, according to federal disclosures. That was more than the 65 lobbyists that Lockheed, the largest defense contractor, employed or the 59 working for Northrop Grumman. Aerospace has been a top issue for Boeing as the company faces increased competition from upstart competitors like Elon Musk’s SpaceX. The bulk of its lobbying is directed at Congress, with just four of 73 reports from 2018 listing contacts with the FAA. In addition to defense issues, Boeing lobbies on a wide range of matters, including taxes, trade, health issues and the federal budget, according to its disclosures. Acting Defense Secretary Patrick Shanahan, who spent more than three decades at Boeing, is under investigation by the Pentagon’s Office of Inspector General because of allegations he improperly advocated on behalf of his former employer even though he has recused himself from decisions on Boeing contracts. Boeing is also generous with campaign contributions. Its spending ranked third among corporate PACs in the 2018 midterms, behind only Honeywell International and AT&T. Boeing spread money to more than 375 incumbent members of Congress, reports filed with the Federal Election Commission show. The Boeing Company Political Action Committee, which is financed by employees, has expanded its contributions to federal candidates in virtually every two-year election cycle since 2000, according to data from the nonpartisan Center for Responsive Politics. The PAC gave $5.9 million to federal candidates and committees in the 2018 election cycle, almost three times as much as it gave in a decade earlier, election-commission figures show. In last year’s midterm congressional election, its biggest single donations — $250,000 each — went to Republican-aligned groups, including the Senate Leadership Fund that’s linked to Senate Majority Leader Mitch McConnell, the American Action Network, and One Nation. Among federal candidates, Republicans received 57 percent and Democrats got 43 percent from the Boeing PAC during the midterms, according to the Center for Responsive Politics. The Boeing PAC continues to contribute at a rapid clip in a non-election year. The Republican Governors Association, the Democratic Governors Association and the Republican State Leadership Committee, got its biggest single contributions — each for $100,000 — according to the monthly report for February filed March 20 with the Federal Election Commission. In total, it gave to almost 100 members of Congress during February alone. That’s more than AT&T, which has one of the most prolific corporate PACs in recent years and gave to 74 members that month. Boeing has focused its campaign donations on incumbents of both parties, slightly favoring Democrats in some years and Republicans in others. That’s a strategy that may help in this crisis. It’s also cultivated former presidents from both parties. In January, it lined up former President Barack Obama, a Democrat, as a motivational speaker for an executive retreat in Arizona, while George W. Bush, a Republican, addressed the group last year. Similarly, Boeing contributed $10 million to help fund Obama’s library and museum in Chicago and also gave $10 million to the Dallas-based George W. Bush Presidential Center to fund an initiative aimed at helping U.S. military veterans transition into civilian life. Boeing got off to a rocky start with Trump, who criticized the company on the 2016 campaign trail for building a factory in China. He also said the company shared its intellectual property with the Chinese government to secure business there. After his White House win, Trump said he wanted to cancel the $4 billion contract Boeing had to develop future versions of Air Force One, the specialized aircraft that flies U.S. presidents around the globe. Boeing swung into action. Chief Executive Officer Dennis Muilenburg called the president-elect and secured a meeting at Trump’s Mar-a-Lago resort to discuss the contract. Boeing also made a $1 million contribution to Trump’s inaugural committee, as it did for Obama’s festivities in 2013. In February 2017, Trump visited Boeing’s South Carolina plant and called its 787-10 Dreamliner long haul jet “an amazing piece of art.” Just over a year later, the White House announced it had reached a deal with Boeing for two copies of the presidential airplane — customized versions of the 747-8 aircraft — at a cost of $3.9 billion.